The Book Life: Introducing Your New Favorite Blog: The (YA) Bookcase + Giveaways!! Introducing Your New Favorite Blog: The (YA) Bookcase + Giveaways!! Hi guys! Today I've got a little something different for the blog. I've recently come across a new blog that I have gotten quite fond of. I've chatted with the girl who runs it and we've had some really awesome exchanges about books. What drew me to their blog initially, is that they are all teens and kids (one girl as young as 7) and they are true book nerds! I think it's extremely cool that they have kids and teens reviewing the books that were written for their age groups and I also like that they have both male and female reviewers. Rachel is the girl who runs the blog and it is for her local indie bookstore, which she also works for. They have a lot of great content on their blog, but not a lot of people know that they are there, so I asked Rachel if she'd be interested in having a guest post featured here in hopes of letting more people know that they are around. Rachel was so excited that she also decided to have a couple of giveaways for the occasion and they are awesome giveaways! 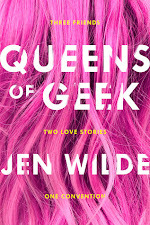 She's written up a post sharing a little about the bookstore that the blog is for and she, along with her friend Amanda, have made a vlog talking about the rest of their reviewing team, showing us some of the awesome books that they've gotten recently for review, and explaining the giveaways that will be going on at both of our blogs! I'm so excited to introduce you guys to this group and I urge you to go check out their blog, if you haven't already! Without further ado, I give you The (YA) Bookcase!! Hi there Book Life followers! My name is Rachel and I run the book blog over at The (YA) Bookcase. This blog actually has a store, The Bookcase, in Wayzata, Minnesota. A little town right off the lake with boutiques, coffee and ice cream shops, a beach and fun restaurants! 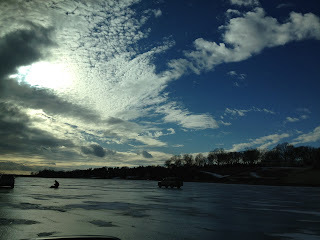 Right now the lake looks like this, but driving on ice is almost just as fun as sailing! The Bookcase has been around since the 1950’s, moving locations all across the Twin Cities but spending most of its time in Wayzata. Right now the owner if Charlie, my boss, who also owns his own theater company and is quite a character. What’s cool about having our bookstore in a small town surrounded by big cities is that you see new faces everyday while also seeing regulars that you know the name of their pets, where their kids go to school and what their spouse has read last. It’s a fun community and we have a lot of lasting friendships with our customers that keep the little indie bookstore up and running. The (YA) Bookcase was an idea in July 2012, the month I was hired as an employee for the independent bookstore. Through an old family friend the manager found out about my own personal book blog I was running at the time. 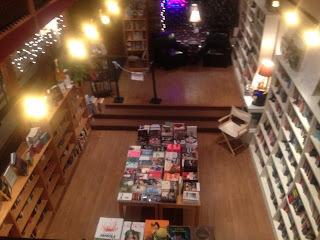 It wasn't popular or anything, but to an old-fashioned bookstore I could navigate two things: social media and websites. Thus, I was hired! A year and a half later, the blog is finally up and running with logos, Twitter, contests, features and more! You might ask, why would a bookstore want a book blog? The answer is soooooo loonnnnng, so I’ll try to spare you the details! 1. Most of The Bookcase employees are over 50, and while there are some high and college students, all of them read adult books and no one has a clue what kids like. That’s where I come in, making sure the employees are up to date with the latest and greatest and the shelves are stocked. I also coordinate young adult author events too. 2. When I was hired, they already had a makeshift ‘youth board’ that reviewed their children’s galleys (or ARCs), but no one was running the board and the reviews were happening less and less often. They’d place the review next to the book when it hit shelves, but nobody ever read them. With me hired, I could revamp the youth board and post these reviews online where customers could read them anywhere. 3. We get something called co-op money when we turn in a review to the publisher (this is a complicated process and we definitely do not get money for every review!). This could range from $15-50 a review. As a little indie bookstore, that's a small but helpful contribution. Obviously, we only turn in our positive reviews, and by sending them a direct link to the blog post they can read it much easier AND other people can read it, which is doubly helpful for them. We're selling and promoting their books online and in person! 4. And simply, social media! If we can get a better reach and more people can hear about our events, that's just an added bonus to having the blog. Whew! With that out of the way, I think the coolest part of our blog is our ambiguous Youth Board—or the ‘team’ as I call it. The reviewers are a montage of people—you have actors, singers, lacrosse players, runners, shoppers--the whole shebang! Many of us grew up together or have been friends for a long time, while others I met when I became an employee. Because we have many reviewers, there’s bound to be someone that fits your criteria! You can follow their reviews by typing their name into the search box, which will bring up all the reviews they’ve ever done. If you’d like, watch our video to learn more about each reviewer, my relation to them and what we’re reading these next few months! Also, we explain our giveaway happening over here on Sarah’s blog and on our own blog. How about a giveaway before you go? I thought you guys might like that! WIN SHARDS AND ASHES, JUST ONE DAY AND THE GODDESS INHERITENCE! *This is a U.S. only giveaway! I’m sorry international peeps, we’ve got no moolah! WIN SCARLET AND BOUNDLESS OVER ON OUR BLOG! We hope you stop by our blog in the future and stay in touch! We love talking books with book lovers and sometimes we like to send you a book you’re looking forward to reading as a thank you. Im looking forward to reading all three, particularly Just One Day. 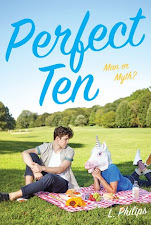 I really love Rachel Carter's series and would love to read the Anthology! I think this is such a great idea of using a blog to help promote your store as well as the books ! 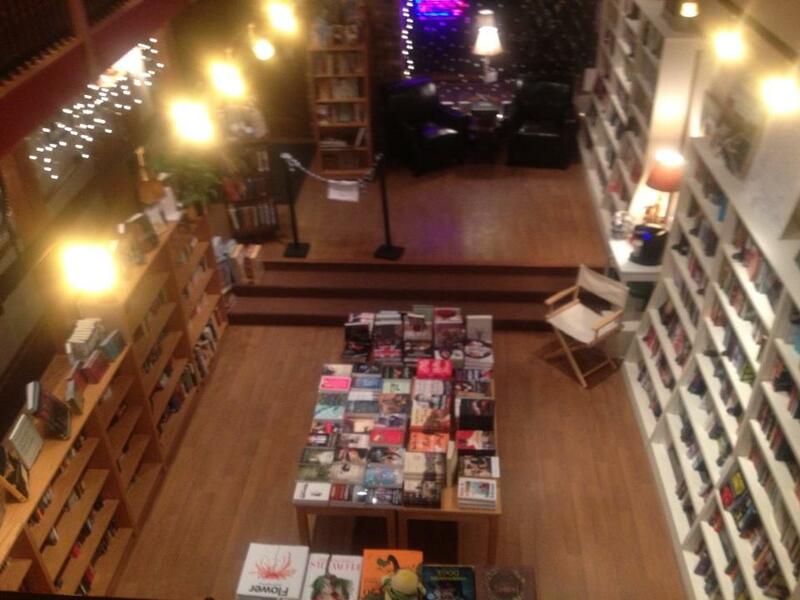 I wish there were more indie book stores where I live! I absolutely LOVE The YA Bookcase, and I'm glad it's getting more attention! Just One Day is one of my most anticipated reads this year! That is so exciting about the store! :D I've been really wanting to read Just One Day and Goddess Inheritance . I'm looking forward to Just One Day and Shards and Ashes. Thanks for the giveaway and the news about the new blog, I'm all signed up by email. I'm really excited about pretty much all of them!! Thank you to all who entered and thank YOU so much, Sarah! You are the best. I hope we stay in touch. I appreciate your enthusiasm for the blog and so does the team! Thank you thank you thank you. P.S. Let me know what you think of Such a Rush! Yes! They all sound so good! I LOVE his blog!! And I can't wait for Scarlet, Unravel Me, and Requium!! Awesome Giveaway!! Oh my gosh! I am super excited to read Just One Day, The Clockwork Princess, and so many more!!! Awesome giveaway, thank you for being so generous! I'm interested to read Just One Day. I've heard amazing things about it. Def the Goddess Inheritance!!! The cliff ending!!!!! !